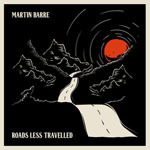 Share the post "Album review: MARTIN BARRE – Roads Less Travelled"
You always thought with Martin Barre’s post-Tull albums that he was searching for his own niche. ‘Away With Words’ in 2013 was a largely acoustic mish-mash of Tull covers and originals, ”Order of Play’ (2014) was essentially a live re-working of Tull tunes. 2015′s ‘Back To Steel’ was a tentative step to the more flamboyant writing style he aspires to. Roads Less Travelled represents the culmination of several more years post-Tull toiling, and some quite extensive touring in North America. Martin is ably assisted by his regular band members especially vocalist Dan Crisp whilst Alan Thomson and Darby Todd hold down the formidable rhythm section. However the addition of Becca Langsford’s lead vocal on a couple of tracks is refreshing and harks back to the female vocals fronting much of 1996′s second solo foray The Meeting. Barre-ophiles may regard Roads Less Travelled as closer in spirit to that earlier album than the more recent solo output. Alex Hart sings the lead on another piece ‘You Are An Angel’. Both ladies provide backing vocals elsewhere. This is a very likeable album although punters expecting to find guitar in extremis will be sadly disappointed. The one instrumental – ‘Trinity’ – is all acoustic and this actually references the wonderful ‘Misere’ from The Meeting, reminding us again of the all-important guitar wig-out that Barre does so well. The emphasis is unashamedly on the song structure and an upbeat vibe throughout. The closing piece also features Josiah J’s Hammond figures which provide a welcome and contrasting texture and perhaps could have been deployed more widely. It is to Barre’s credit that there’s a breezy accessibility to these tracks, from the opener ‘Lone Wolf’ to the appealing title track. If there’s one criticism, for this reviewer a couple of crackling electric instrumentals would have just tipped this latest offering to stellar proportions and satisfied the die-hards. This entry was posted in ALBUM REVIEWS, ALBUM REVIEWS (Mobile), All Posts and tagged album, classic rock, Dan Crisp, guitar, guitarist, Jethro Tull, Martin Barre, review, Roads Less Travelled, rock. Bookmark the permalink.